I have long been inexplicably entranced by Russia. I have collected the little black boxes painted with a single haired brush, taken more Russian literature courses in college than English, read Anna Karenina more times than I can count. No, this novel is not filled with ‘crazy names’. But, it is filled with the way that people had to live under Stalin’s leadership. 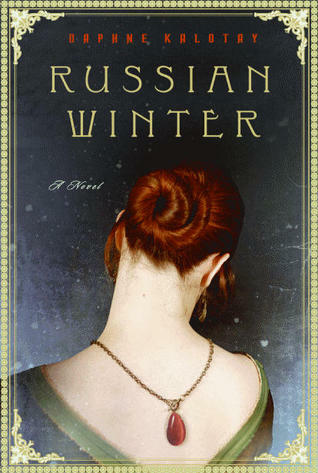 Interspersed with that time period and today is the story of Nina Revskaya, a prima ballerina, who refuses to talk about the past let alone the amber jewelry which she has offered for auction. The other characters who enter in are Grigori Solodin and Drew Brooks who help unravel the mystery behind Nina’s dreadful, and heart-wrenching, secret. When I taught in Germany, in the mid 1980’s, the wall was still up between the East and the West. We were required to visit The Wall and found it to be multi-layered. The fence was laced with hidden mines, the road behind it was patrolled by soldiers in jeeps, the towers over all had searchlights and armed men. “It’s to protect you from the West Germans getting in,” the people on the East side were told. Only, no one was ever caught trying to enter the East side of Germany. They were only shot trying to get out. That experience, and the way I now feel America could become a country under leadership which is meant to protect us but only takes our freedom, echoed throughout my mind as I read this most fascinating novel. I was intrigued by this book when I first heard about it, but like your friend, Russian names intimidate me.Your review has eradicated that concern, however, and I look forward to reading it myself one day. I really need to read this book soon. It's been calling my name for a while. I've long held a fascination for Russia as well, I'll have to put this one on my wishlist! I don't really get on with Russian literature but I am fascinated by its history. I did a module on the Russian revolution for my history GCSE and haven't look back since. I'll read practially anything non-fiction about Russia or communism.It must have been such an experience to be in Germany at that time. I was 3 when the wall came down and I can still remember my mum and dad jumping up and down in front of the television. Molly, there's no need to be intimidated in the slightest. The names of the characters are very easy, and it's really a wonderful story.BermudaOnion, that's what happened to me: I saw it on several blogs, and then when a friend of mine said he'd read it, I knew I had to pick it up. Fortunately, the library had a copy so I didn't have to buy one of my own.Elizabeth, this is far easier (and shorter) than War and Peace! Now that's a book with som extensive 'crazy names'! 😉 Still, it's a truly wonderful novel as I'm sure you're discovering.Melody, first let me give a long woverdue thank you for the novel (Star of the Sea) you sent me. It looks fabulous, and I really appreciate you taking the time and effort to ship it. Secondly, isn't Russia or communism fascinating? The thing about the later is I always think it should work in theory, and yet I see it so doesn't. How can individual effort and determination not be rewarded? Have you read Atlas Shrugged by Ayn Rand? That was a hugely pivotal book for me.Sam, it was amazing to be in Germany then. Lots was going on as Khadafi was pulling his antics too, blowing up parts of the airport in Frankfurt, or bars where American soldiers who were protecting the Western side of Germany hung out. I haven't read much Russian Literature, but this sounds so good. I love the cover of that book and your enthusiasm for it – makes me realize how much I need to read more Russian Literature. I'll definitely be adding this one to my TBR list – it just sounds so fascinating. Thanks! Sounds like an intriguing read. I used to love Russian Lit. in school, way back when Solzhenitsyn was popular. I've put them aside for decades but now you've made me curious again. Currently, I'm starting to read Sarah's Key, although not a Russian setting, it's also about a harsh regime… the Nazi's. Have you read it? Arti, I have a sample of Sarah's Key on my Nook, but I haven't read it yet. For some reason (the child on the cover?) it reminds me of Sophie's Choice, which was a very hard book for me emotionally. I never seem to cope very well with the destruction the Nazis caused in people's lives. Definitely one that I've had my eye on for a while. I took ballet as a child and felt certain that Mikhail Baryshnikov and I were meant to be. Anwho, that obviously didn't happen, so I now love to read anything related to Russia and ballet – so with this combining both interests, I'm even more motivated to get it and read it.Fascinating insight into your time in Germany – my father traveled quite a bit for business and he was able to visit the Wall once. It sounds like you felt a powerful connection to this book. My favorite books are always those that have me thinking on many different levels. It sounds like this one did that for you. I've had this on my list for awhile now. I really need to check my library. I've always had a fascination with Russian history and I even took Russian language classes in college.I love books you can connect with. I've been looking at this book for a while but now you've made me want to pick it up very soon. It sounds intriguing, and that cover! Gorgeous. Vishy, you're the only one to pick up on my ending thought, which strikes me very powerfully. I used to believe America was the land of the free and the home of the brave, but now I very much fear this may not always be true. Our leadership, as well as outside forces, both make me very uncomfortable.